On April 25, 2019, Symphony Nova Scotia will present “Link Up: The Orchestra Sings” with nearly 1,500 students from all over the province in two performances. This Carnegie Hall Weill Music Institute program pairs Symphony Nova Scotia with elementary students at local schools to explore orchestral repertoire through a hands-on music curriculum, culminating in a concert where they sing, play recorder, and/or play the violin with the orchestra from their seats. “Link Up” is a highly participatory, internationally acclaimed program that pairs orchestras across the country with schools in their local communities. Created by Carnegie Hall’s Weill Music Institute in 1985, the program invites students to learn about orchestras and symphonic music through a year-long, hands-on music curriculum. Each year focuses on specific concepts, including rhythm, melody, tempo, orchestration, and composition. The culmination of the annual program is a live joint performance, giving students the opportunity to sing and play recorder or violin along with their partner orchestra. This performance often serves as students’ first concert experience, and provides them with a unique opportunity to apply the musical concepts they’ve studied. Conducted by Nova Scotia music education specialist Gary Ewer, the concerts are titled “The Orchestra Sings”, and feature a blend of traditional and classical music, arranged especially for the orchestra and students. Highlights include Come to Play by Thomas Cabaniss; Ode to Joy from Symphony No. 9 by Ludwig van Beethoven; New World by Antonín Dvořák; and Simple Gifts by Robert Maggio, among others. Due to space limitations, the concerts are not open to the public. Members of the media, school boards, and all levels of government are encouraged to attend. Symphony Nova Scotia is one of more than 70 national and international organizations chosen for this program. 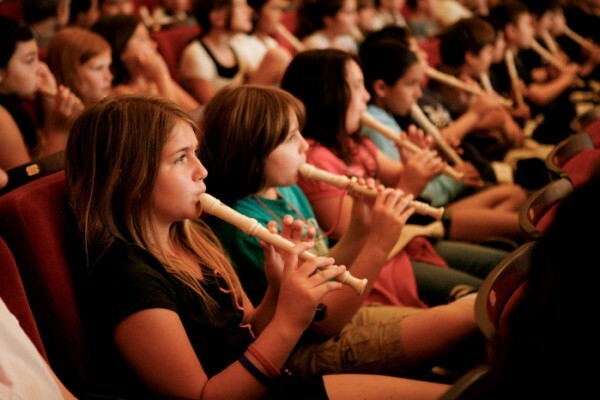 Link Up’s national partnerships grew out of the program’s ongoing work with New York City schools, through which Carnegie Hall has engaged hundreds of thousands of students in musical learning since its inception in 1985. Visit carnegiehall.org/LinkUp for a complete list of participants and further details. The Weill Music Institute creates visionary programs that embody Carnegie Hall’s commitment to music education. With unparalleled access to the world’s greatest artists, the Weill Music Institute inspires audiences of all ages, nurtures tomorrow’s musical talent, and harnesses the power of music to make a meaningful difference in people’s lives. An integral part of Carnegie Hall’s concert season, these programs facilitate creative expression, develop musical skills and capacities at all levels, and encourage participants to make lifelong personal connections to music. The Weill Music Institute generates new knowledge through original research and shares a wide range of free online resources with educators and music lovers around the globe. More than 450,000 people each year engage in the Weill Music Institute’s programs through national and international partnerships, in New York City schools and community settings, and at Carnegie Hall. Gary Ewer is a composer, arranger, conductor, and clinician. A native of Halifax, Nova Scotia, he has an extensive background in instrumental and choral conducting. He is the current director of Dalhousie University’s Collegium Cantorum choir, as well as former director of the Dalhousie Chorale and Chamber Choir. He has also most recently been a Senior Instructor of Music at Dalhousie, teaching aural skills, music theory, orchestration, and choral techniques. As a public school music teacher for many years, Gary conducted concert bands, choirs, and the Halifax Schools Symphony Orchestra. His choral and instrumental compositions and arrangements have been performed by the Elmer Isler Singers, Symphony Nova Scotia, the Halifax Camerata Singers, and many other ensembles. His works are published by Kelman Hall Publishing and Pantomime Music Publications.